If you're visiting Kansas City during Thanksgiving, you're just in time to catch the annual kickoff to the Christmas holiday season, the Plaza Lights event at the Country Club Plaza. From its first ceremony in 1930, this annual event has grown to be one of the most spectacular holiday traditions in the region. The lighting event is held on the evening of Thanksgiving and marks the official start to Christmas in Kansas City. The lights, which are turned on by a celebrated guest, remain on through mid-January. To prepare, workers from the Kansas City Power and Light Company (KCP&L) utility string more than 80 miles of lights with 280,000 glittering jewel-tone bulbs for the holiday lighting display. 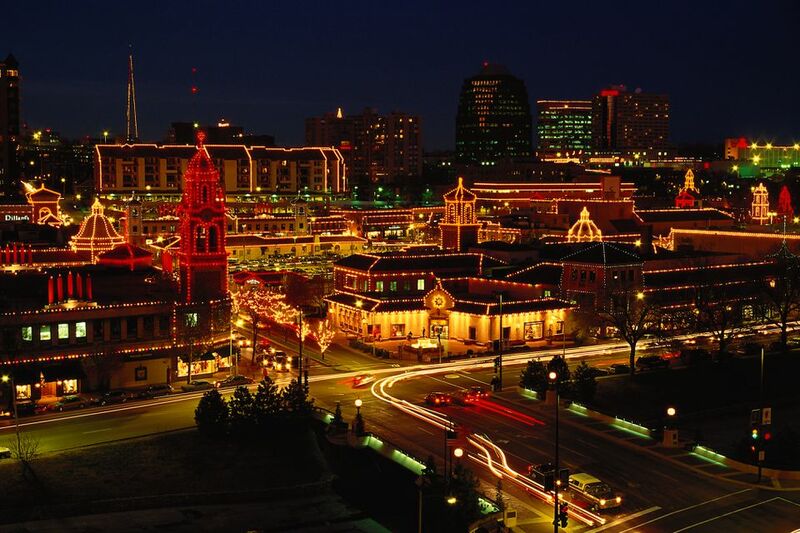 Once lit, these lights illuminate 15 blocks of the Spanish-inspired Country Club Plaza shopping district, outlining every dome, tower, and window to create a glittering Christmas wonderland for tourists. The ceremony itself takes place on a huge stage situated at Nichols Road and Pennsylvania Ave. in front of Brio and Burberry. Performers, musicians, and the Plaza Lighting Ceremony orchestra perform here throughout the event; as the lights go on, helicopters fly overhead with people who want a close-up view of the spectacle. Anyone who can't make it down to see the event in person can watch it on KSHB Channel 41, which usually hosts the ceremony and televises it live. To confirm times and place, visit the Country Club Plaza website. The event kicks off with a pre-show with giveaways and performances by local talent followed by the official lighting ceremony. The ceremony concludes with the lights of the district being flipped on by an honorary guest. A post-show concert closes out the night, and the lights remain on each night for the rest of the year. So, even if you miss the main event, you can still come and explore the beautifully illuminated Country Club Plaza any time during the holiday season. If you're planning on staying in Kansas City for Thanksgiving to catch the annual Plaza Lights event, there are plenty of other things to do in the area while you wait for that Thanksgiving evening tradition to start. Once you're ready to turn in for the night after all that Thanksgiving turkey, you can choose from hotels like the Courtyard by Marriot, Embassy Suites, The Fontaine, Hampton Inn, Holiday Inn, The Intercontinental Hotel, Kansas City Marriot, The Raphael Hotel, Residence Inn, Sheraton Suites, and the Southmoreland Inn for your overnight accommodations.